Please note that products from Europe are shown as priced but there could be a small dollar increase as the prices fluctuate from time to time due to falling dollar. Also, you will need to call for shipping quote which is not included in price but usually runs between $25-$35.00-not bad considering shipping rate increases this past year and the size and weight of the items. Ventilated sides and doors to allow for easy air flow and quick turn over. Made in Germany. Made in Canada. FSC certified Canadian Spruce. 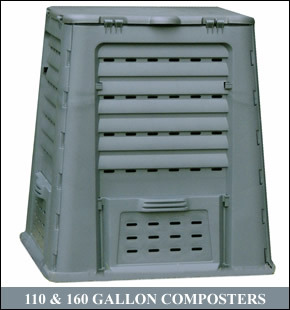 This composter offers a natural look and is made of torrefied wood that will last for 15-20 years. Ships from TX. not included. Perfect for the small back yard garden or enclosed patio. 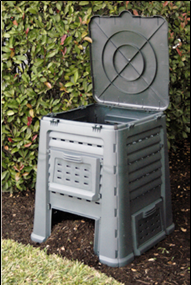 AeroQuick Composter by Juwel of Austria-Med. 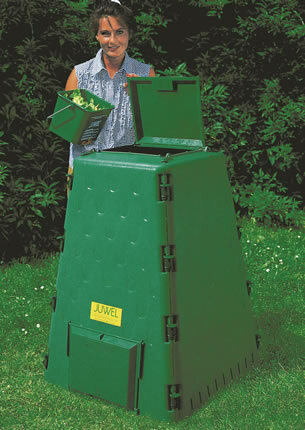 AeroQuick Composter by Juwel of Austria--Lg. Earthmaker-- From Australia. World's First Continuous Cycle Composter. Makes 10 Gallons of Compost a Month. 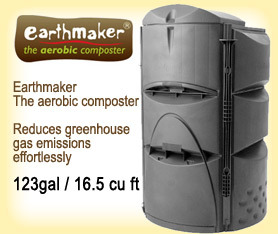 Aerobic composter $279.00 plus sh.